For more than 10 years, Marie Osmond has been headlining one of the top-selling shows in Las Vegas while in constant demand for television appearances and as a commercial spokesperson. Together with Merrill, Jay and David Osmond, Marie and The Osmonds have over 80 million records sold and really know how to entertain today’s audiences with an evening of family entertainment that can be appreciated by all ages. 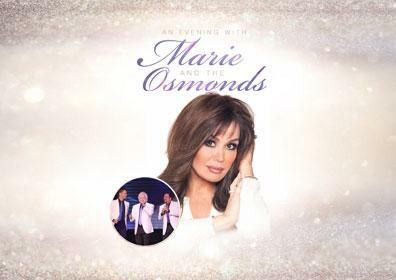 Don’t miss Marie & The Osmonds live at the Silver Legacy Resort Casino on Saturday, March 16. Their show, like the family members themselves, spans generations and musical styles and includes something for everyone – from Elvis to Aerosmith and not forgetting the hits that all those fans came to hear – “One Bad Apple,” “YoYo,” “Paper Roses,” “Crazy Horses,” “Down by the Lazy River, “Meet Me in Montana,” “Love Me for a Reason, “You’re Still New to Me” and so many more. The audience feels like a part of their family; a family that has experienced and contributed to the soundtrack of our lives. More than singers, they are entertainers with over 50 years of funny stories, memorable pictures and loyal fans. Marie has spent five iconic decades in the entertainment business performing as a successful singer, television performer and talk show host, dancer, actor, author, entrepreneur and public speaker. She has continued to maintain relevance, remaining an instantly recognizable figure across the globe. Her debut single “Paper Roses” reached the #1 spot on two Billboard charts, a feat that not only placed her among an elite class of musical royalty, but instantly catapulted her into international superstardom. Marie is a multiple gold and platinum-selling artist and CMA Award™ winner, garnering numerous Billboard chart-topping singles and albums and three New York Times Bestselling books. Merrill Osmond and Jay Osmond, two members of the original Osmond Brothers, began their careers on “The Andy Williams Show” in the 1960s, became bestselling pop stars in the 1970s and continue to tour the world to this day. There is no substitute for the real thing and as the first family of entertainment, The Osmonds bring joy to audiences everywhere with hit after hit from the true rock and roll era. From winning the “Golden Ticket” on “American Idol,” to his 2017 Emmy™-nominated performance on TV’s “Wonderama,” David Osmond sings many styles of music and performs alongside greats such as Stevie Wonder, The Eagles and Steven Tyler, not to mention the members of his own famous family. Tickets will go on sale Friday, Jan. 12 starting at $69.50 can be purchased at Ticketmaster.com or by calling 775-325-7401. To see the full lineup of Epic Entertainment coming to THE ROW, including the most played country artist of all time Tim McGraw and “Parks and Recreation” star Aziz Ansari, visit SilverLegacyReno.com.